164 pages | 3 B/W Illus. Advancing a constructivist conceptual approach, this book explains the surprising outcome of the Economic Partnership Agreements (EPAs) between the European Union and developing countries in Africa, the Caribbean and the Pacific (the ACP countries). Despite the EU’s huge market power, it had limited success with the EPAs; an outcome that confounds materialist narratives equating trade power with market size. Why was the EU unable to fully realise its prospectus for trade and regulatory liberalisation through the EPA negotiations? 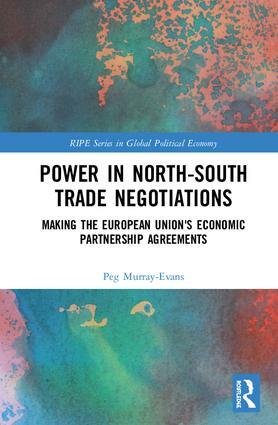 Emphasising the role of social legitimacy in asymmetrical North–South trade negotiations, Murray-Evans sets the EPAs within the broader context of an institutionally complex global trade regime and stresses the agency of both weak and strong actors in contesting trade rules and practices across multilateral, regional and bilateral negotiating settings. Empirical chapters approach the EPA process from different institutional angles to explain and map the genesis, design, promotion and ultimately limited impact of the EU’s ambitious prospectus for the EPAs. This volume will be particularly relevant to students and scholars of international trade and development and the EU as an international actor, as well as those researching international political economy, African politics and international trade law. Peg Murray-Evans is a research associate in the Department of Politics at the University of York. Her research explores the way in which power in global economic governance is shaped by claims to legitimacy and the institutional structures in and through which these claims are made, with a particular focus on development and the Global South. She has worked and published on topics including the role of South Africa as a ‘rising power’ in global governance, European Union trade and development policy and the UK’s relationship with the Commonwealth after Brexit. Her research has been published in European Journal of International Relations, Third World Quarterly and The Round Table.